One question I always ask myself about old school hip hop is: does it still sound fresh to my ears because it reminds me of my youth or because it is so good it said relevant more even 20 years after it was released. 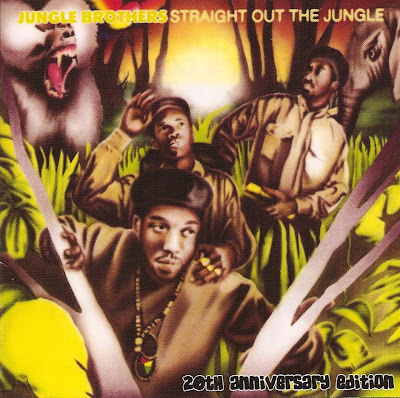 Concerning me, 21 years ago, I was finishing high school and never heard of the Jungle Brothers. Hip hop was a really far far away galaxy and I was more into French FM crap. Consequently, I presume that Straight Out The Jungle is a seminal album still sounding really good today even if digital hip hop fiends may find it a bit dated. Infused with uncredited jazz, soul and James Brown samples, the first Native Tongue posse album ever released is still to me a breath of funky innovative fresh air. Composed of Mike Gee, DJ Sammy B and Baby Bam, the Jungle Brothers didn't really survived the 90's, at least artistically , but they paved the way for all the Golden Age hip hop to come and even invented hip house with the Todd Terry produced I'll House You. I posted this record in a Czech Republic special edition which comes with 6 bonus tracks: 2 well known I'll House You remixes and 4 rare instrumental pieces. Peace.